We hear a lot about the damaging effects of UV (ultraviolet) radiation. Many of you probably already know the risks, as this is a common cause of skin cancer. UV is not something you can see or feel which makes it difficult to analyse. Most UV radiation comes from the sun, but it is also prevalent in tanning beds. If you are interested in learning more about the effects of UV rays, you can download an augmented reality app called seeUV. seeUV is an innovative app which is available free for Android or Apple users. It has been designed to educate Australians about our harsh sun, and the damage UV rays can do. You probably forget about your previous sun exposure and subsequent sunburns. However, your skin does not forget and over time this damage accumulates and may present itself years later. This could be in the form of skin cancer or premature ageing. 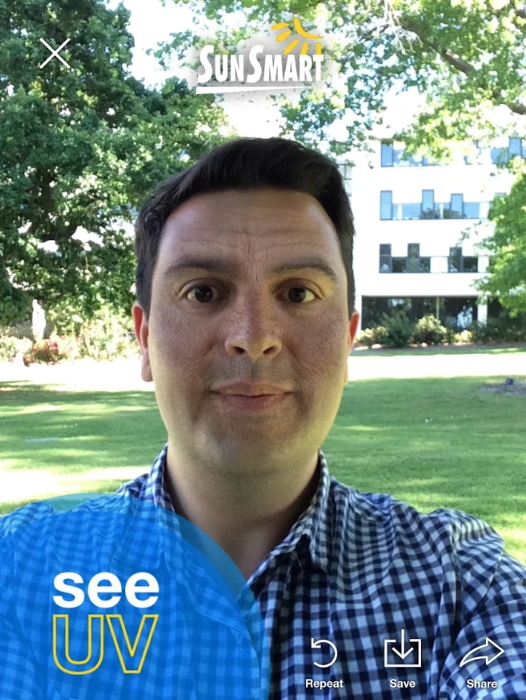 The seeUV app comes from SunSmart, and uses augmented reality to show users how this damage could eventually look. This will give you a realistic and perhaps startling insight into just how powerful these invisible rays can be. This uses the UV readings and current temperature in your location based on information from the Bureau of Meteorology (BOM). The app assesses the data to determine the strength of these UV rays. When the screen shows red rays, this acts as a warning of a high level of UV radiation outside. Green rays reflect low UV levels. Even more interesting is the face mask function, which shows you what this type of damage might look like in the future if it happens to you. This could include wrinkles, sun spots, photoaging, discolouration, and blotchiness. While this app isn’t designed to be a diagnostic tool, it does help to educate Australians. The novelty of the face mask feature may just be enough to increase awareness, and encourage people to share what they have learnt with their friends. Just because the weather is overcast, it doesn’t necessarily mean there is no risk of sun damage. Instead of using temperature to predict potentially harmful sun exposure, a more accurate approach is with the UV index. When this index is 3 or above, sun protection measures are recommended. This includes sunscreen, long clothing, sunglasses, a broad rimmed hat, and shade. Remember, anything over Low indicates sun protection should be used. It takes just 10 minutes to get burnt during the summer months. Tools such as these should not replace personalised, professional advice. If you are concerned about your skin, please book a full skin and body check with one of our experienced team members.